This post is sponsored by Bob’s Red Mill. All opinions are my own. This recipe truly celebrates the harvest. Summer produce overlaps with the autumn bounty to warm you from the inside out just as the first kiss of chilly air settles in. This is my favorite kind of meal to prepare for a crowd because it makes a lot, but I also love whipping it up when it’s just me and Taylor because the leftovers taste great served over toasted sourdough bread (with a fried egg on top) ladled over pasta, or served on top of roasted potatoes. I hope you all love this recipe as much as we do. I was so happy to learn from my friends at Bob’s Red Mill that their organic corn grits are sourced from Oregon farmers and are in my range of 200 miles. So this recipe fits into our Local Thirty challenge and it was a home run. Cheers to simple comfort food! Preheat the oven to 400F. In a large roasting pan, toss all the veggies with the red pepper flakes, oil, vinegar, and salt. Stir well. Season the mixture with a few good grinds of black pepper and bake it for 45-55 minutes, or until the vegetables are tender and lightly browned, and the tomatoes have released their juices. Stir the veggies halfway through cooking. Meanwhile, prepare the polenta by bring the water to a boil in a large pot. Slowly add the grits to the boiling water and whisk vigorously until their are not more clumps. Reduce the heat to low, and simmer until the polenta thickens up a bit. 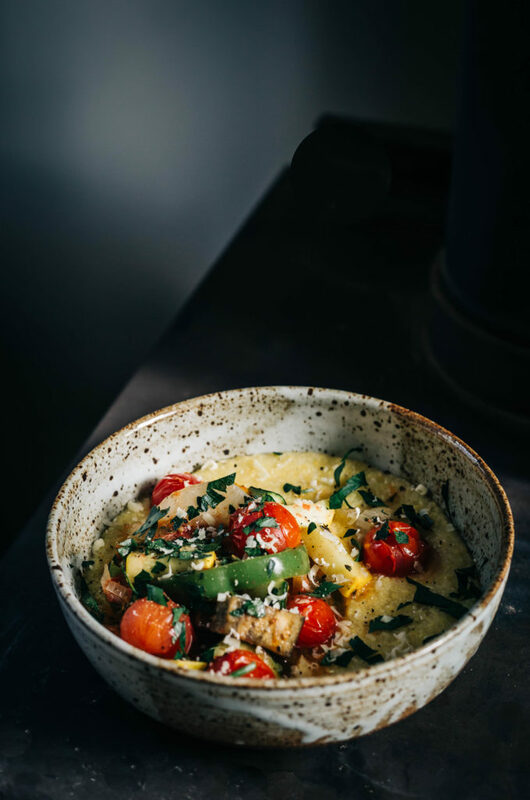 Cover the pan and cook for about 30 minutes (the time will very depending on the brand of grits you use so see package directions for times) and use a wooden spoon to stir the mixture every 5 minutes or so until the polenta is creamy and the individual grains are tender. Add the butter and cheese and stir to combine. Divide the polenta between bowls and top with the ratatouille. Sprinkle with minced parsley and additional grated cheese.